Hal Perry was elected MLA for District 27 Tignish-Palmer Road in 2011, and re-elected in 2015. Hal served as Minister of Education, Early Learning and Culture in 2015 – 2016, and was the vice-chair of the Council of Ministers of Education, Canada. 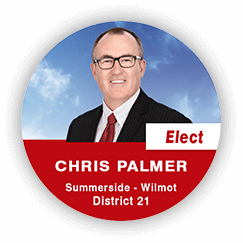 He has also served as Chair of the Standing Committees of both Health and Wellness, and Agriculture and Fisheries. Prior to his election, Hal was employed as a Property Development Officer with the PEI Department of Environment, Energy and Forestry. Hal has been a committed community volunteer. He has served as President of the PEI 4-H, Leader of the Tignish 4-H Club, and President and track and field coach with Special Olympics PEI. He has also volunteered with the Tignish Irish Moss Festival for the past 35 years. He has formerly been Chair of the Tignish Silver Fox Winter Carnival, President of the Tignish Home and School Association, President of the M.E. Callaghan Junior High Home and School Association, and a Director with the PEI Home and School Federation. Hal and his wife, Brenda, currently reside in Tignish with their two sons, Jack and Ben.